Empires Chinois et Japonnais et Roy.me de Lieou-Kieou. 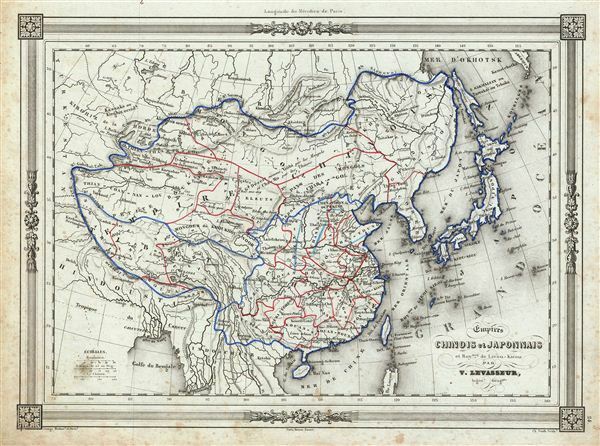 An uncommon and extremely attractive 1852 map of China and Japan. The map covers all of Japan and covers China from Kachgar east to Korea and north as far as Siberia. extends south to include the island of Hainan. Formosa or Taiwan is also included, though notably malformed, reflecting the primitive state of the regional survey. Also included are the Liu-Chiu (Ryukyu) islands, an independent kingdom until 1878 when they became an integral part of Japan. The disputed body of water between Korea and Japan is here identified as the Sea of Japan. Throughout, the map identifies various cities, towns, rivers and assortment of additional topographical details. The map features a beautiful frame style border. Prepared by Victor Levasseur for publication as plate no. 24 in Maison Basset's 1852 edition of Atlas Illustre Destine a l'enseignement de la Geographie elementaire. Barbie du Bocage, J. D., Atlas Illustre Destine a l'Enseignement de la Geographie Elementaire, (Paris: Maison Basset) 1852. Very good. Blank on verso. Minor foxing throughout.